The Vectorworks Design Scholarship recognizes students around the world who are pursuing education as a means to build their skills and solve challenging design problems. Students across all design disciplines may submit their best work, created in any software program, and answer three short questions to be considered for cash prizes up to $10,000 USD and other awards. The program supports promising students on two levels. 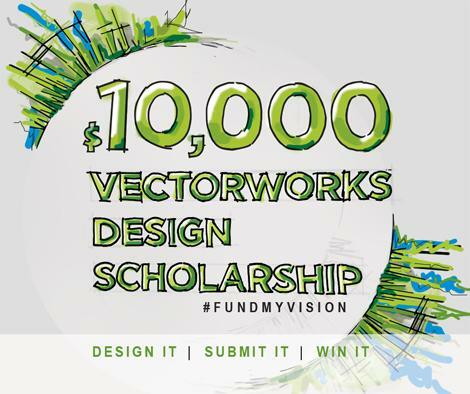 First, Vectorworks Design Scholarships will be presented to multiple winners around the globe. Prize packages include $3,000 USD, Vectorworks Designer with Renderworks software for a computer lab at the winner’s school and virtual or in-person training for faculty and students. The submission deadline is July 30, 2014. Winners will be announced August 30, 2014. Second, all Vectorworks Design Scholarship recipients will compete for The Richard Diehl Award, a global award named after the founder and current chairman of Nemetschek Vectorworks that recognizes the top overall submission to the program. The winner will be announced September 10, 2014 and receive an additional $7,000 USD. The Vectorworks Design Scholarship is designed to meet the needs and qualifications of a variety of students. At the time of submission, scholarship applicants must be: 1) enrolled or accepted for enrollment in undergraduate or graduate studies for six or more credits at an accredited college or university, and 2) pursuing a design-oriented degree. Such degrees include, but are not limited to, architecture, engineering, construction, environmental design, urban design, urban planning, interior design, graphic design, landscape architecture, landscape design, lighting design, industrial design, machine design, theater design, scenic design, event planning, exhibit design, and woodworking.